American Goldfinch, Great Blue Heron and Killdeer at Manayunk Canal. Second Color Printing of Reduction Woodcut in Progress by Ken Januski. If I had carried on over the last two days assuming that the weather report I saw on Sunday morning was accurate I'm not sure things would have changed all that much. I suppose the extreme, 'life-threatening' warnings forced me to resign myself to staying home all day Monday and Tuesday, thus giving me time to concentrate on the new reduction woodcut. But I wanted to work on it anyway, blizzard or no blizzard. As it turned out we got less than 2 inches of snow in our neighborhood. I can't complain, though we'll have to keep waiting to try out our snowshoes. I'm sure that there are people north of us along the Atlantic Coast that are happy for all the warnings. I've added a burnt umber here, a color I hadn't originally intended to use. 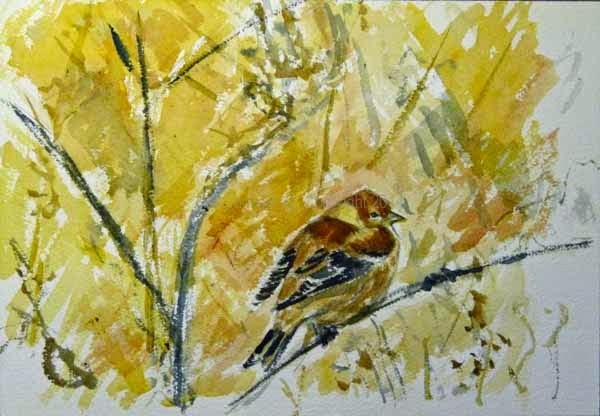 I had hoped that the earlier yellow ochre could suffice for all of the American Goldfinch and Killdeer as well as most of the shrubs and twigs. But I soon realized that wouldn't work. I needed to add a second brown. It's turned out a bit browner and less warm than I'd hoped but the color will change again once I add the blue and black. As usual with a print, there are a million things I could complain about. But all in all it's proceeding more or less as I had hoped. But finishing is always the hardest part. So stay tuned for further developments. Print is 9x11 inches, by the way with the actual image 6x8 inches. It's printed with soon-to-be obsolete Daniel Smith Water-soluble Ink on Rives Heavyweight Paper. 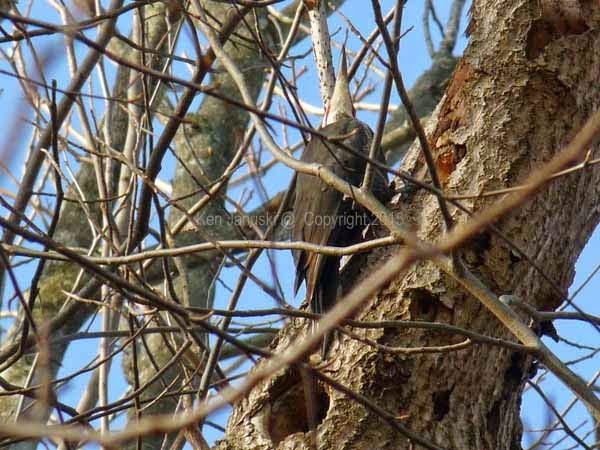 In case you don't remember or didn't read the post regarding the Philadelphia Mid-Winter Bird Census of a few weeks ago this was based on observations that day along the Manayunk Canal in Philadelphia. Over 225 Snow Geese Flying Over Morris Arboretum. Photo by Ken Januski. Snow Geese Flying Over Morris Arboretum. Photo by Ken Januski. So I had a nice day out birding today, seeing a number of new birds for the year. When I got home I had a very late lunch and turned on the television to see a blizzard warning for New York City. Blizzard?! We're not exactly next door to NYC but close enough. How could the 1 inch that was predicted for us turn into 12-24 for New York? Well as soon as I investigated I saw that we were now expected to get 14-24 inches. 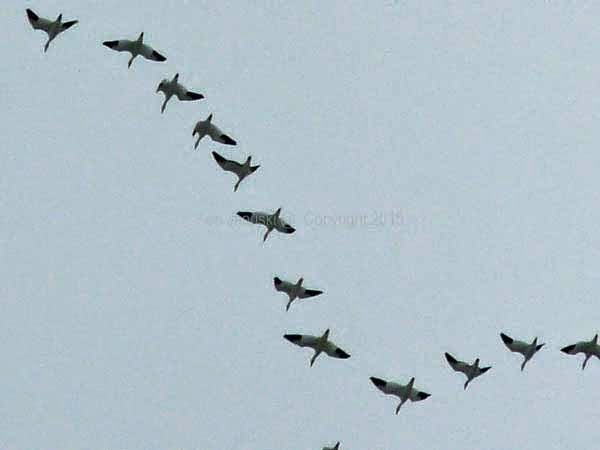 So I guess that may help to explain the flock of 750-1000 Snow Geese that I saw flying over Morris Arboretum today. I was still changing shoes in the back of the car talking to someone from the arboretum when we heard some squawking, a squawking that didn't sound right for Canada Geese. I grabbed my camera and binoculars which were still in back of car and not yet around my neck to take a quick look. In the next minute or two three large flocks flew by. 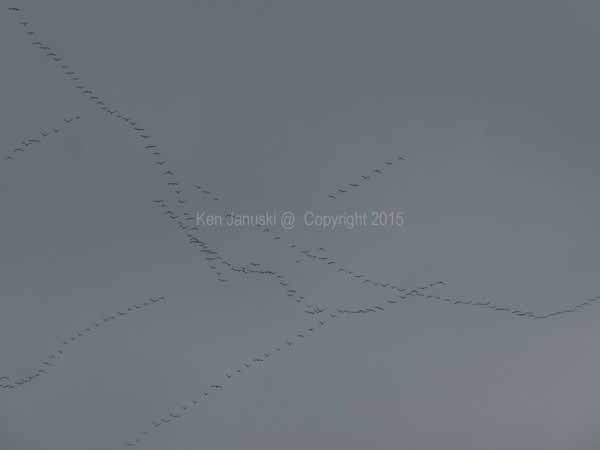 The photo above shows that they are in fact Snow Geese. The top photo show just how many. The top photo is part of what we thought was a flock of 200. But there are 229 birds in that photo and it's not the complete flock. So my guess is that we actually saw closer to 1000 Snow Geese. Is their flight related to the upcoming storm? It's hard to say but it's a noticeable coincidence. 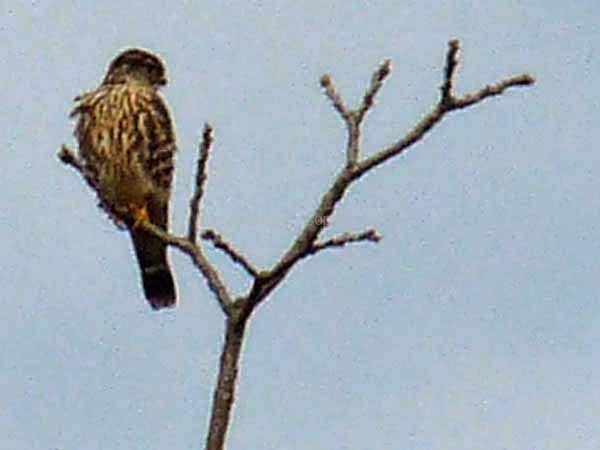 Merlin at Houston Meadows. Photo by Ken Januski. Male Pileated Woodpecker at Houston Meadows. Photo by Ken Januski. As I walked through Morris today I saw spots where I expect to see warblers and other spring migrants and breeders. That got me started thinking about spring. I do love the birds of spring. But I've also come to love the birds of winter, like Snow Geese, and Merlin, pictured above. Pileated Woodpeckers are here all year but they're often easier to see in winter. I like the photo above because it shows (though you may need to magnify it) the red on sides of the cheek of the male woodpecker. Northern Pintail. 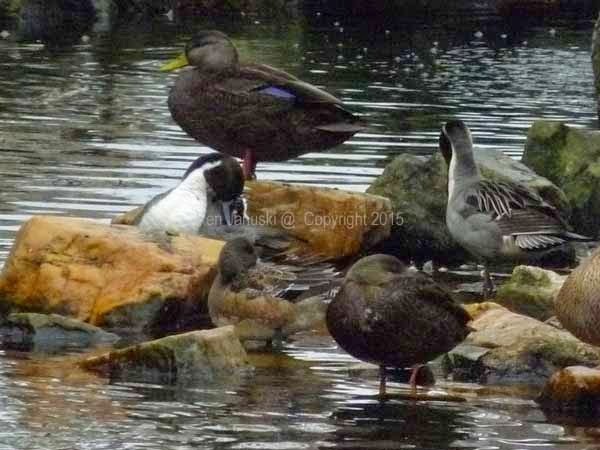 American Black Duck and American Wigeon in Swan Pond at Morris Arboretum. Photo by Ken Januski. Immature Red-shouldered Hawk at Houston Meadows. Photo by Ken Januski. Other birds more commonly seen in winter include ducks like the surprising Northern Pintail and American Wigeon joining the slightly less surprising American Black Duck and quite predictable Mallards in the Swan Pond at Morris today. Below them one of two beautiful Red-shouldered Hawks seen at Houston Meadows earlier in the week. With such birds around right now it's hard to be anxious for spring and its birds to get here. Though I may have second thoughts depending on how large our next snow fall is. 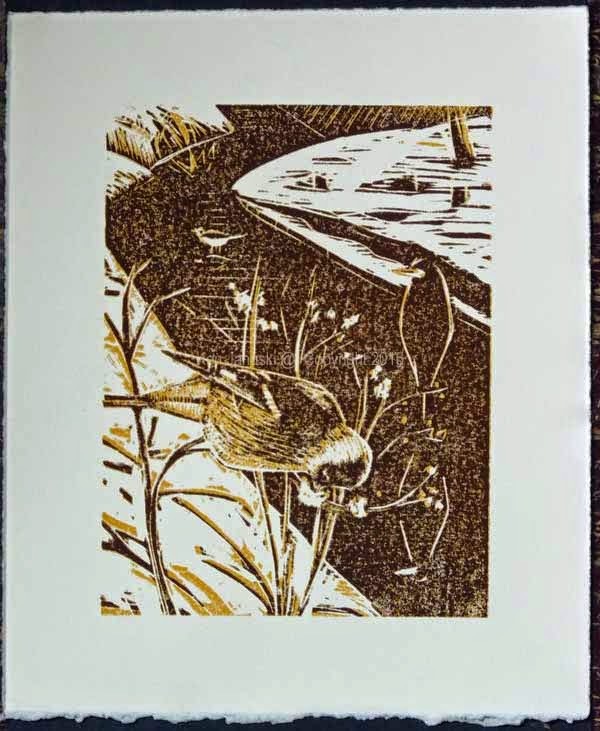 Amidst all this winter birding I have continued work on my new reduction woodcut. Above is the first color printed on Rives Heavyweight paper. I still have 2-3 more colors to print. I had thought I could get by with just two, but I think I need to add another brown for the gold finch, and then a blue and a black. If I'm snowed in for the next few days I may make good progress, a term I confess I've never understood. What other kind of progress is there? Bad progress. Back before the world of business totally destroyed the English language that would have been called regression. American Goldfinch, Great Blue Heron and Killdeer at Manayunk Canal in Winter. 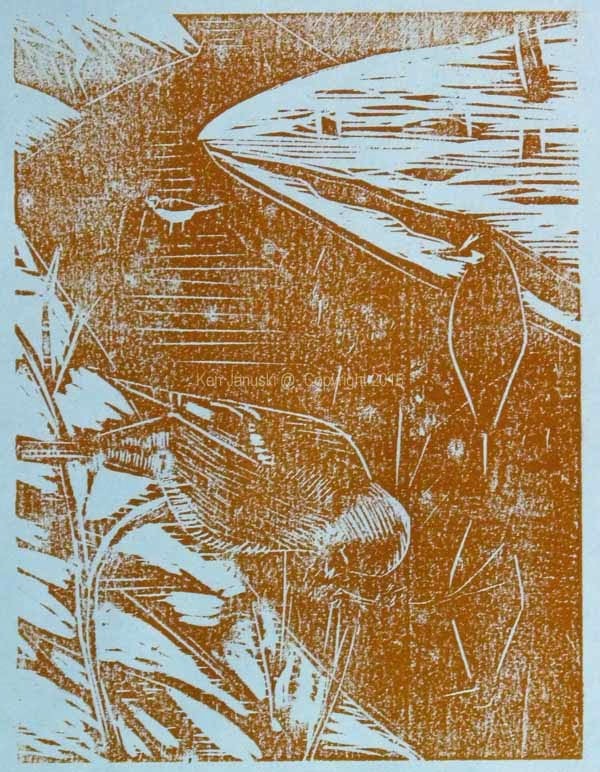 Reduction Woodcut by Ken Januski. Early Proof. I really can't remember the last time I did a 'pure' reduction print. After struggling for what seemed weeks a few years ago to do complex reduction linocuts using oil-based inks I backed off from the process. Part of it was the technical ordeal involved. Part of it was my getting tired of breathing the solvents necessary for use with oil-based inks. But part of it also was aesthetics. I realized that I was using reduction linocuts as though I was painting, oil painting, where I could keep adding colors until the painting/linocut looked right. But this is counter-productive in a way. With a reduction print you keep cutting away the part of the surface that will print. So yes you can keep adding more colors, but the area on which you can print them gets smaller and smaller. So they have less effect. Another aspect of reduction print as painting is that I was more interested in the overall surface, how one area was one color and another area a different color, one small area bright and another dark. That's the way most painters think. But often this is at the expense of line. 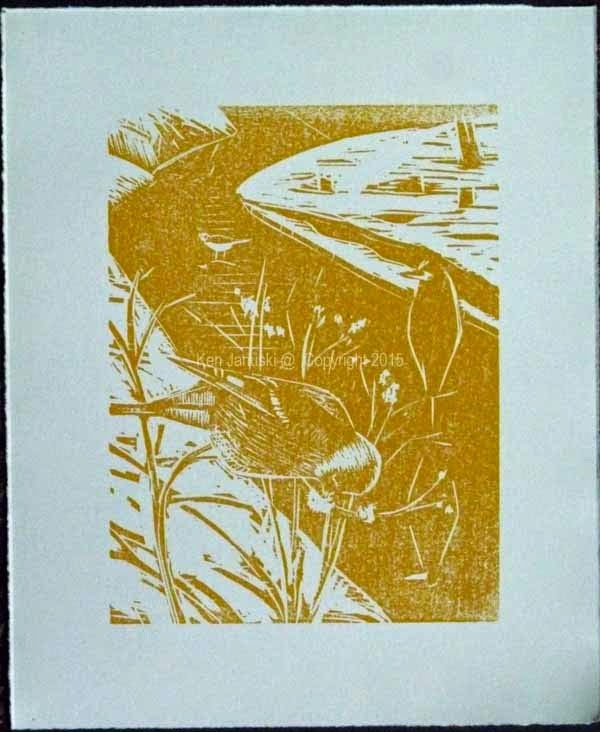 I think in my earliest prints, including the complex oil-based reduction linocuts I didn't care much about line. When I moved to multi-block woodcut or a combination of that and linocut I became much more concerned with line. It's a major element of so many prints in the history of printmaking. And of course it's generally associated with drawing. Since I love to draw it's no surprise that I liked the idea of making line more important. Off the top of my head I'd say it's been a very important part of my prints for the last two years or so. To make a long story short I've been curious as to what might happen if I returned to reduction prints, though in this case reduction woodcut rather than reduction linocut. Above is the second test proof on copier paper. It's based on the numerous sketches and watercolors that I've showed during the past few weeks. I'm sure I'll be tempted to 'rescue' the print by adding a second block. But for now I'm going to try to keep it a pure reduction print. I'll only use this one block in the print, come what may! My complex reduction prints of the past often used 5-10 colors. All those colors make registration all the more difficult. But I used them because I was thinking like a painter. I used however many colors I needed, and could stand printing, in order to get the look I wanted. Here, as in other recent woodblocks I don't plan to use that many colors. At first I thought four or five. But right now I'm hoping I can get by with just three. This isn't a matter of laziness. It's just a matter of trying to stay simple and see what happens. This is also called the KISS principle, something I first ran across in computer programming: Keep it Simple Stupid! It's always made sense to me though I haven't been the best practitioner. American Goldfinch. Pencil Sketch by Ken Januski. I always hope I won't jinx whatever I'm working on by posting sketches as well as thoughts before I've actually finished the work. That's even more so today because I haven't even started the print yet. Instead I've been doing pencil sketches of the main characters. Following the Killdeer of the last post I've spent part of the last two days on fall plumage American Goldfinch. I observed some particularly handsome ones in the middle of the Goldfinch on Thistle woodcut of a few months ago. Based on those photos I did the previously posted watercolor below. However I didn't think I wanted to use this pose in the print. More likely I'll use one of the two lower sketches in the sketch above. American Goldfinch. Watercolor by Ken Januski. I'm still undecided on what type of print this will be. I'm a bit tempted to make it a reduction linocut, where I keep cutting away from the linoleum after printing a color. It's been quite a while since I've done one. If that's the case though I'll lose much of the detail and precision that I've gotten in the recent pencil sketches. Still that might keep it close to the initial pen and watercolor sketch below. The next step is to rework the composition, at least as a thumbnail. After I have a better idea of what the final composition will be like then I'll also have a better idea of how to portray it in print. American Goldfinch, Great Blue Heron and Killdeer Along Manayunk Canal. Pen and Watercolor Sketch by Ken Januski. To get back to the danger of writing about this all in advance. Obviously there is a fair amount of work going into it. Let's hope with all this mountainous buildup that I don't produce a tiny mouse. I'ts been known to happen. 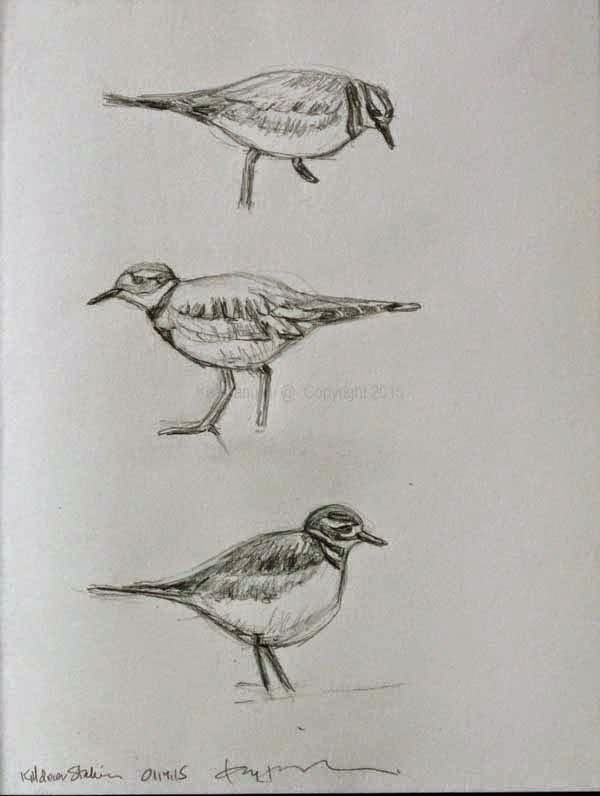 Killdeer Studies. Pencil Sketch by Ken Januski. 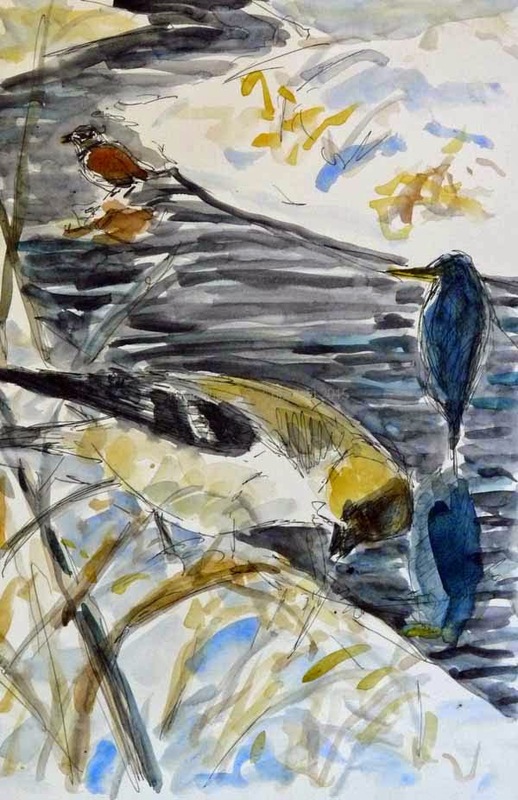 When I did the pen and watercolor sketch of an American Goldfinch, a Great Blue Heron and a Killdeer that I showed in last post, I wasn't really concerned with detail. 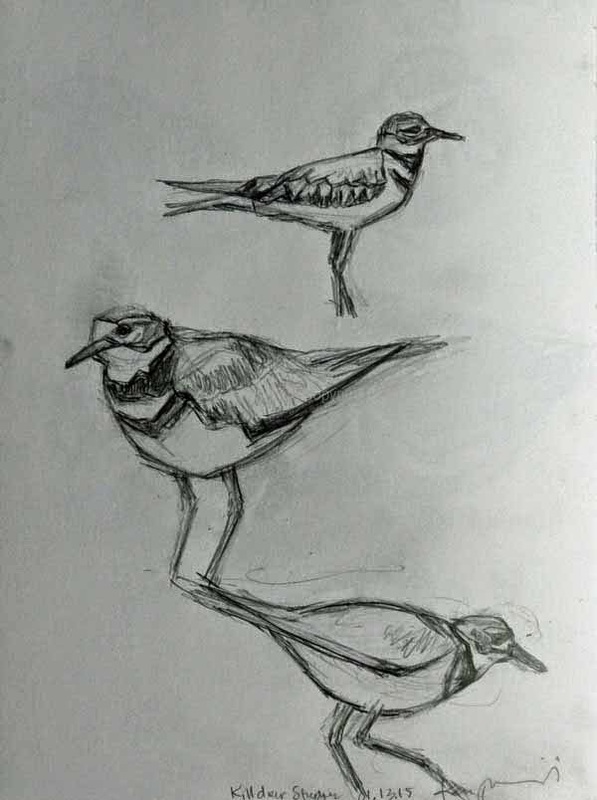 I was hoping that the three birds would be recognizable but I don't think that proved true for the Killdeer. That wasn't really a problem to me. My intent as I said in post was to give some sense of the experience of seeing all of those birds on a very cold day along the Manayunk Canal. Still I was disappointed that the Killdeer didn't look like much more than a blob. Since then I've continued to toy with the idea of a print based on that sketch. If I make one the three birds will have to be somewhere between shapes that are nothing more than blobs and a more photographic rendering. The Killdeer will be the smallest shape, assuming I keep it in the far background. and so it will need the most simplification. It will be too small to have much detail. And yet it has to be more than a blob. So that's the purpose of the pencil sketches above, done over the last two days from photos that I've taken. I'd like to get a better since of Killdeer before I start simplifying them. Great Blue Heron are probably one of the easiest birds to simplify. Especially in cold weather they have a distinctive hunched shape that is unique. The problem with them is not making them too simple and including at least some detail so that it looks like a bird not a caricature of a bird. In the end I'll try to coordinate all of these birds. That was the main point of the sketch from the last post, to explore how they could all fit together. I'm happy with that sketch and probably won't change the general composition. But whether it will be a woodcut or a linocut, using one color or more, using one block as a reduction print or multiple blocks all still have to be determined. One thing I can predict with some accuracy though is that the final birds will be closer to blobs than to the renderings above. I hope that they will be a happy medium, somewhere in between. But I do think it's safe to say that most of this detail will not appear in the print. American Goldfinch, Great Blue Heron and Killdeer Along Manayunk Canal. Watercolor and Pen Sketch by Ken Januski. 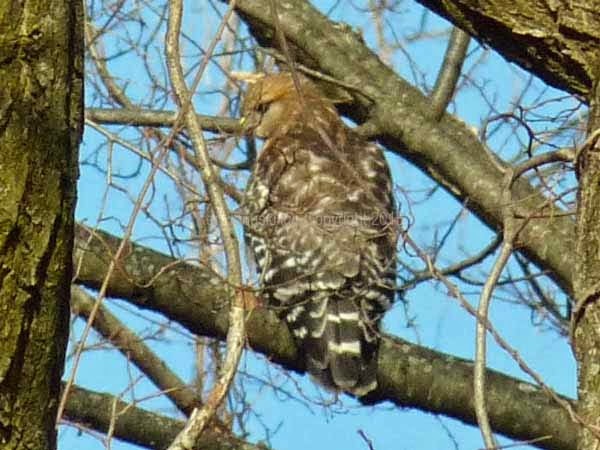 Yesterday was the 29th Annual Philadelphia Mid-Winter Bird Census. We've taken part for a number of years, probably around 10 or so. Though we'd been looking forward to it the predicted wind-chill of 0 degrees at 7 a.m. was a bit worrisome. And we were going to start off along the Manayunk Canal and Schuylkill River, which meant that it would probably be even colder. That predicted coldness probably got us off to a slightly later start than normal. Still sun was predicted and that can make all the difference, both for being warm and for seeing active birds. We were on the road by about 7:30, after counting some yard birds, and finally got home about 4:30, with a couple of bathroom breaks and one quick lunch. I haven't totaled our species, since they include a number of locations as well as a few birds n the car along the way (well actually close to 300 since they included large flocks of Ring-billed Gulls, Canada Geese and European Starlings). My guess is that our total will be about 35 species. The average total over the years for all species from all participants has been 92. With a number of warmer winters recently, really almost too warm for it to feel like a winter bird census, it will be interesting to see if this year's count is higher or lower than recent ones. I do know that in spite of the cold it was a beautiful day to be out. Days like this, especially when they include almost the entire day outdoors, remind me of just what an enjoyable season winter can be. I took a number of photos along the way, mainly for documentary purposes, especially in the case of rare birds, as with the Green Heron a couple of years ago. The bird that we see the least over the years, and that we saw yesterday, was one solo Fox Sparrow. I took some bad photos of it. My guess is that none of our birds will be all that unusual, unless they are made rarer than usual due to the cold weather. Most likely the Killdeer we saw at Manayunk Canal and the Eastern Bluebirds at The Schuylkill Center for Environmental Education will be our best candidates for rare birds for the count. Eastern Bluebirds are always around in winter but it often seems that they are hard to find. In any case I'm not showing any photos. As you well know I don't find much excitement in them. Instead I'd like to portray or elicit some sense of the actual experience of being out birding, and seeing birds, for the count. The scene at top is a reality-based seen but not one actually seen. We saw the Killdeer, American Goldfinch and Great Blue Heron at the same time in the same spot. But we didn't see them like this. The composition is an example of artistic license. It's hard to know what to call this watercolor. Is it an illustration? Is it art? Is it somewhere in between? It's an illustration in the sense that I'd like it to give a sense of yesterday's experience. But most illustrations, as the term is used today, include much more detail. It is art in the sense that formal concerns are important, especially the sense of composition and color. But it's also very quickly done, and it needs to be. I want to post it today, when the Philadelphia Mid-winter Bird Census, is still timely, not a week from now when I've been able to spend more time on both detail and artistry. Some would say timely deadlines make it closer to illustration than to art. It really doesn't make much difference. I think I'll just call it a sketch. I find such sketches very rewarding. I don't get lost in detail. And I often try new things. It's amazing to me how many more developed works stem from sketches like these. A year ago I did a fairly unsuccessful watercolor of a similar scene, a Killdeer and Great Blue Heron in the same location along the Manayunk Canal. Since then I've toyed many times with making it into a print. I think the temptation will be even stronger with this new sketch. March Eastern Phoebe. Pen, Watercolor and Waterbrush Sketch by Ken Januski. First Bloom of 2015 - Winter Jasmine. Photo by Ken Januski. OK, the first art of 2015 is no surprise. This blog is mainly about art. And the first flower of 2015 also makes sense. 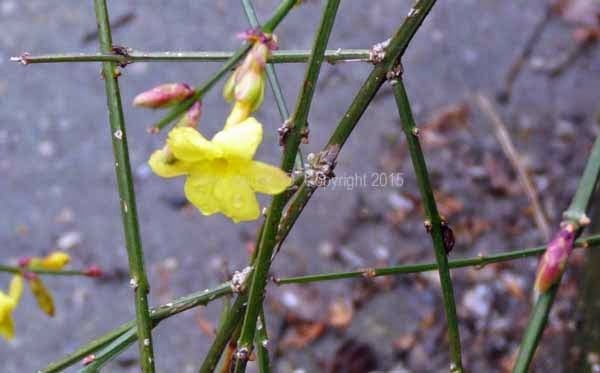 It's not the first time I've shown a photo of Winter Jasmine. But why no first bird of 2015? Well the main reason is that the only birds I've photographed so far this year are either dead, a Canada Goose and a Great Horned Owl, and have been pretty thoroughly devoured, or they are birds in the process of eating other dead animals, in this case Turkey Vultures and dead White-tailed Deer. Some would probably find these photos fascinating but I'll spare other readers and just mention them verbally. I did notice today that our Winter Jasmine has started to bloom. This plant can be a bit of a nuisance because it drapes to the ground where it immediately roots and pretty soon you can have an impenetrable mess. As ours is in the front yard we have to try to keep it pruned back so that it doesn't entangle postmen, deliverymen or ourselves. Nonetheless when the cold, gray, seemingly lifeless days of winter are here there's nothing like being knocked out of the gray doldrums by these bright and hardy plants. 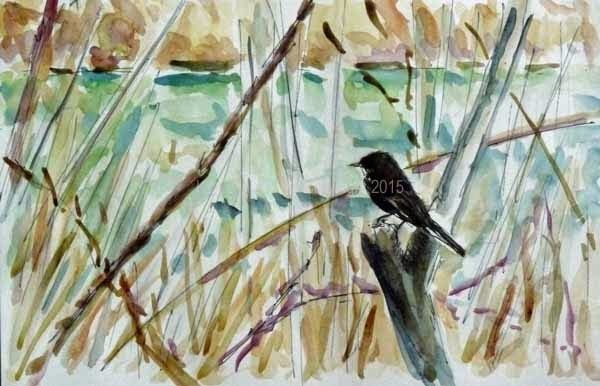 The top photo is of a small watercolor sketch of an Eastern Phoebe photographed a year or two ago. It's an avian harbinger of the arrival of spring and the departure of winter. Phoebes always arrive in March or so, assuming they haven't overwintered as one did last year. Though they're a bit drab, not unlike their surroundings in March they still lend a sense of brightness and optimism in early March. As I looked through my photos today trying to figure out what my next painting or print might be I was struck by the photo that this is based on. The reason I was struck is that is gives a good idea of what an Eastern Phoebe actually looks like, a long fairly thin bird, but one with a thick head and neck. The photo seemed to be a prototypical Eastern Phoebe. I liked that because I'd like to be able to capture birds based on something as simple as their silhouette. The American Wigeon that I sketched in last post exhibits the incredible beauty of bird feathers ( the bird itself, not my sketch). But I have little or no interest in painting or sketching those feathers. I understand why many do. But it's just not of artistic interest to me. I was reading Kenneth Clark's Landscape into Art recently and in the section on the Impressionists he said that he thought all artists who relied solely on the portrayal of nature as seen, as nothing more than visual sensation, eventually became disappointed and either devolved or moved to something new, nature-based but not just a copy of nature. This is a bad paraphrase but the point is: eventually art has to enter the equation. It is never just a matter of portraying what you see. Clark was speaking of landscape but it applies equally to birds and wildlife I think. At some point you have to have something more. He says, and I think it's true, that this is determined by the artist. It's not some law imposed from outside. Eventually artists get tired of just 'copying' nature. They try to bring something more to it. In many artists it is artistic order. But not always. There are other methods. In any case that's the way I approach art with birds as subject. I know that I can always keep practicing and studying and get more accurate in my portrayal of birds. I could get better, probably much better, with complex plumage. But I see it as a dead end so I don't even pursue it. I'm interested in still being true to birds in some way but not as an exact copy, especially in terms of their plumage. That is why I often do sketches like the pen, watercolor and watercolor brush sketch at top. My first idea was to capture the prototypical silhouette of an Eastern Phoebe. But I was equally interested in making a painting by combining light, color and texture to place it in a setting. When using a waterbrush and this type of pen the ink from the pen runs. That's fine. In fact I want it. 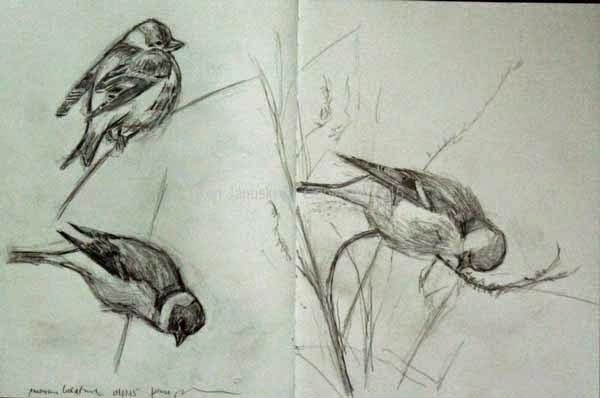 It keeps these away from realism and allows me to continue to explore an artistic way, or at least my artistic way, to portray birds. That is far more interesting and rewarding to me than the portrayal of feathers.